After a long march for our team into a new way of doing business as a HubSpot Agency Partner, in April, our agency was finally rising out of the trough of early Q1. The team was engaged, the clients were (mostly) pleased with our level of service, and we had a growing pipeline of excited prospects. 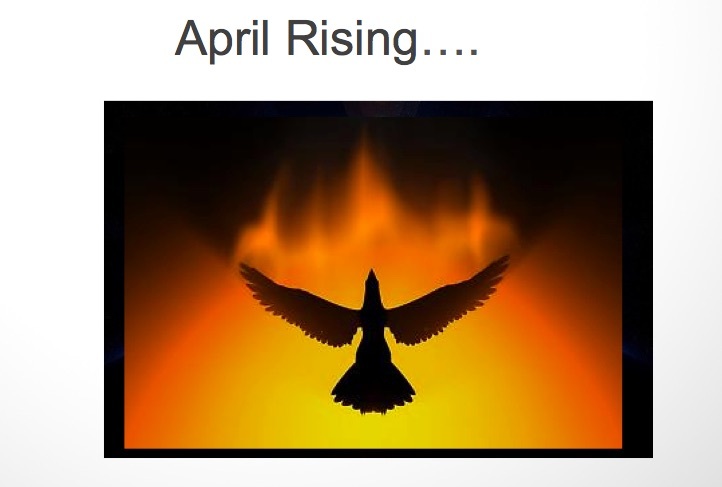 The theme of our April team meeting at Innovative Marketing Resources (IMR Corp). This theme was fitting for us as we were finally on the other side of a long march to reorganize the way our small client services team worked together. April was about taking our lessons learned in Feb + March and using them to climb higher up the hill of profitability >> which could only come from successfully managed engagements with our clients. Our newly energized team and our model was helping make that happen for sure. 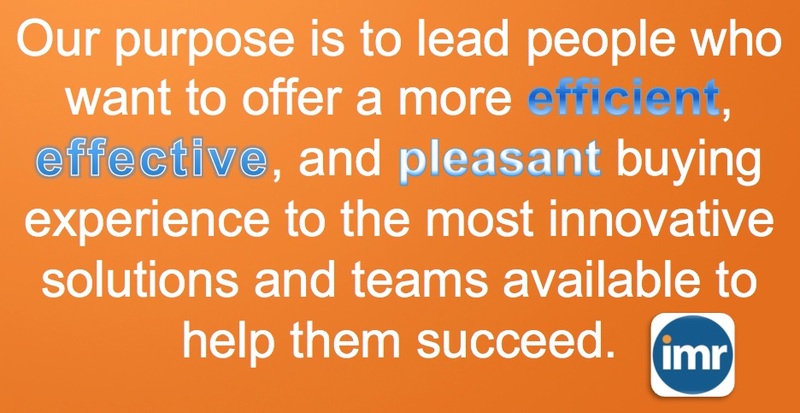 Just like we did when I was making agency partner training on the team at HubSpot Academy, we begin ever IMR team meeting with reviewing and recommitting to our team's purpose (pictured above). It's still a bit too wordy for my tastes, but it captures the essence of why everybody on this team is here. I took all of their "this is why I'm here" answers and melded into this. If you have better wording suggestions, I'm all for it. We are looking to further refine our purpose as our team continues to learn, grow and evolve. As part of my monthly pilgramage to HubSpot Headquarters in April, my old leader at HubSpot Academy - Mark Kilens and I finally get some time to sit down together for an old fasioned 1:1 like we used to have every week during my 2.5 years working on his team at HubSpot Academy. You cannot properly evaluate a team member's effectiveness if you do not have a solid set of goals and objectives established for them to accomplish throughout that year along with a skills development plan that you all agree on. If you're not prepared to have a solid team meeting, postpone the meeting. It's better that your team wait a bit to hold that meeting until you are fully prepared to present and discuss rather than have them join a meeting that's half-baked and might sow confusion. Sometimes it makes sense to meet with key team members 1:1 more than once a week, especially if they have a big project (or set of projects) they are working on. Mark is doing this more. [Pictured above] A pic I snapped while working out of my backyard on April 9th: The spring weather brought sniffly noses (especially for our baby boy Grantham) but also a boosted mood and a sense of cautious optimisim for the future of our agency. We made our sales target for April and exceeded it in May! We are ahead of plan on sales! Which is the "rocket ship taking off" on the sales front. One of our clients wanted to expand their content project by refreshing two aging ebooks and giving them an updated look and updating their content - so we had an expansion opportunity that came from that. A couple of opportunities came from HubSpot Agency Partners who knew me from my days of leading up the HubSpot Partner Broadcast and brought us into clients and/or prospects they were working with. Still more opportunities came from referrals from our close relationships we had invested in on HubSpot's direct sales and customer services teams. Being a well known, local Platinum Certified HubSpot Agency Partner (with a veteran HubSpotter like me at the helm) has helped. I have to admit, just makes for a less risky referral for HubSpotters to make introductions to me over other agencies who are not as close by, well known, or who lack that credibility when it comes to inbound services experience. 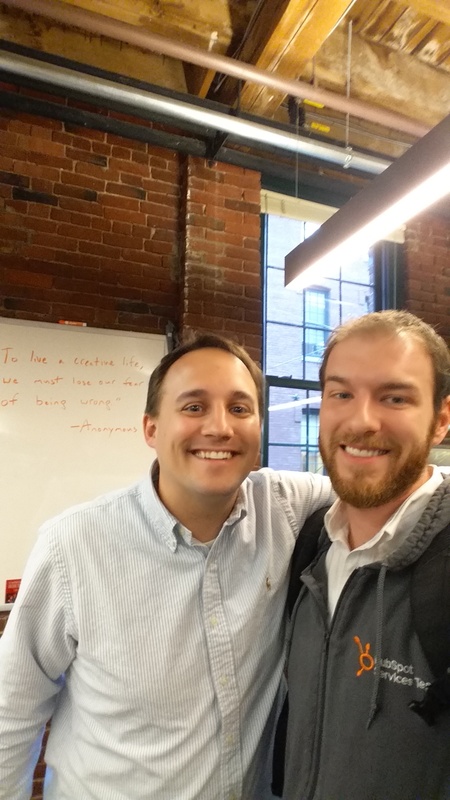 Another opportunity came from a customer I met at the local boston HUG (HubSpot user group). As I had said in my last recap, the seeds we had planted in early Q2 had sprouted and bloomed throughout April + May. Helping our client champions tell their inbound success stories: Remember those inbound ROI stats I shared from one of our clients, The Wellness Institute in my March recap?? 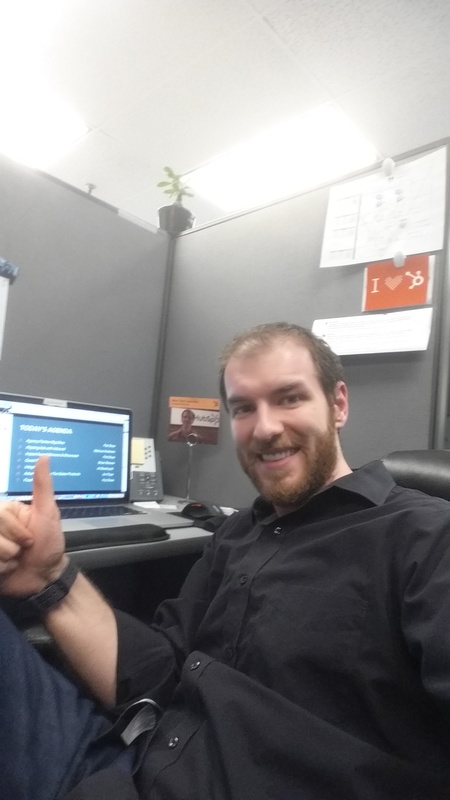 Check out this 4/21 Nick interviewing our client champion at Wellness, Jesse Hartman on his road to 1k blog subscribers and beyond! Helping bring on board a net-new HubSpot Customer. Our alliance efforts with HubSpot’s Sales team (thanks to Danielle joining me during these meetings at HubSpot HQ back in November) finally paid off in April! 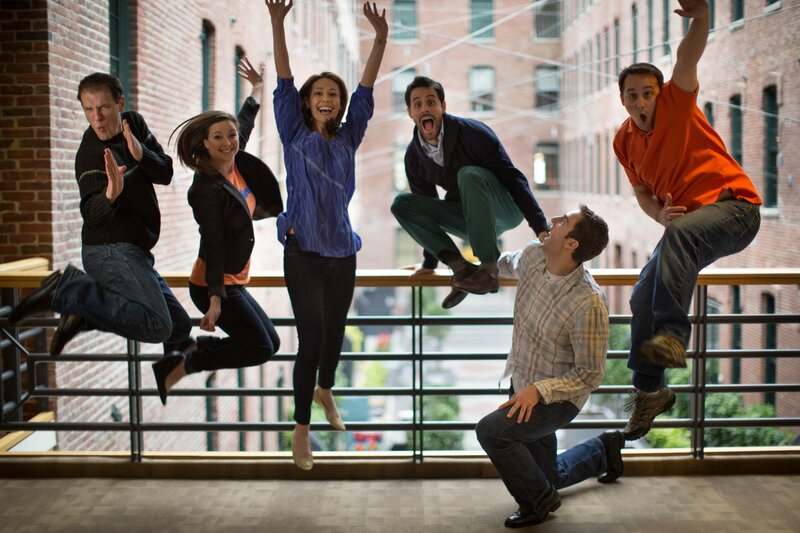 We were referred an opportunity that closed and really proved ourselves in the eyes of this HubSpot sales rep! This was a big win for me as it was the first such deal we've closed in my 6 months on the team and also it gave us a chance to go through HubSpot onboarding on this customers behalf (along with the migration to HubSpot's website platform etc.) Great to get back into my days of HubSpot on-boarding consulting. [Above]: Myself and long-time friend and higher edu-centric HubSpot Agency Partner, Mickey Baines of 4th Dimiension Partners are pictured here co-delivering a virtual workshop to the admissions and marketing communications departments of Indiana Purdue Fort Wayne University on 4/29. 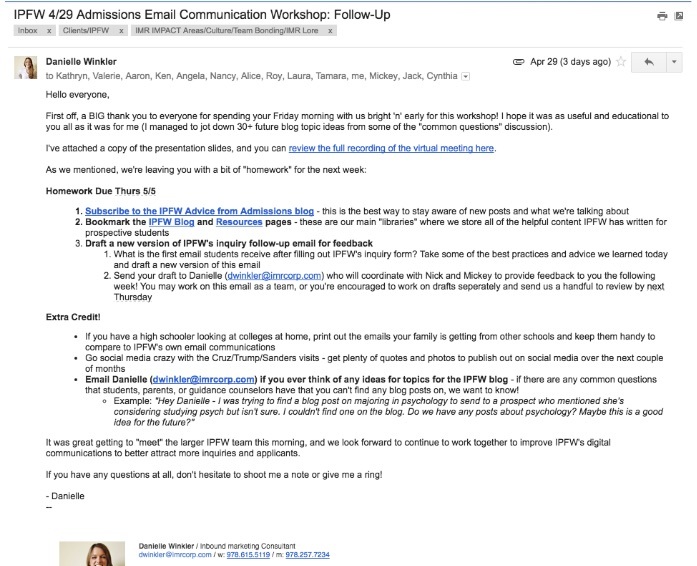 The clients seemed quite delighted and I personally am delighted by the speed and succinctness of Danielle’s follow up email to the IPFW admissions & marketing team afterwards! [Above]: We have a team principle here at IMR called "Follow up and follow through" and Danielle certainly kept to that principle in the quality of her follow up after the workshop we delivered for this client. Specific resources, examples and next steps for the admissions and marketing teams to apply what they learned productively in the weeks ahead. 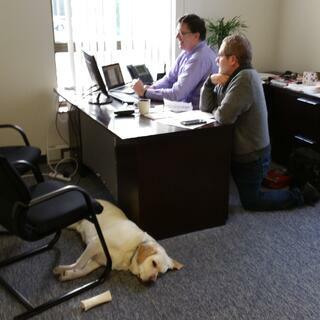 [Above] April 14th: No, they're not finishing their taxes last minute, this is a pic of IMR agency founders and business partners Kevin Jorgensen and Joe Pettirossi working together on a proposal for one of our new clients we brought on in April. Although we were moving in a positive direction and generating more revenue than we had in months, IMR was not a super profitable agency through April. While we continued to tweak the team and business model, I had been doing my best to keep the team motivated to work hard on our march up the hill. I wanted to give them the best experience and support that I could while building that vision of an awesome future (which included hopefully greater advancement opportunities with increases in pay) just around the corner. 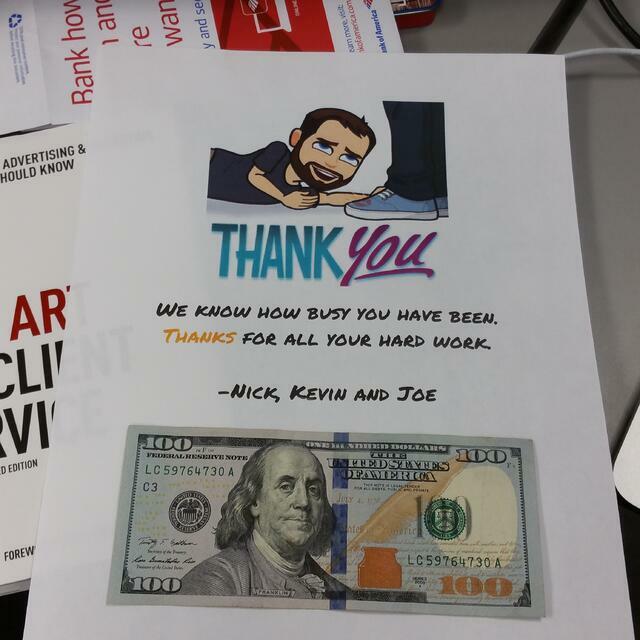 In the meantime, we tried to make small gestures like this improtu $100 gift to each team member at the end of a particularly long and demanding week in mid-April. I told them to take it and surprise their significant others or friends that weekend with a splurge. It was the least we could do to thank them for their support. 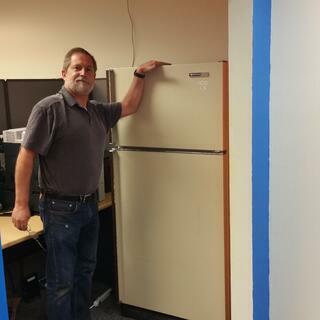 IMR co-founder Kevin Jorgensen, an engineer by trade, is also our defacto head of facilities and technology at our scrappy little firm. Here he is showing up our "new" fridge he got to replace "Fridgey" our old fridge for many years that had finally started weezing and shutting off occasionally. Kevin knows how to "freecycle" so he was able to swap it in for another one pretty quick. If you're in a small office, you can appreciate a little win like this. Kevin's gesture also reminded us that we all roll up our sleeves, even for the little issues. 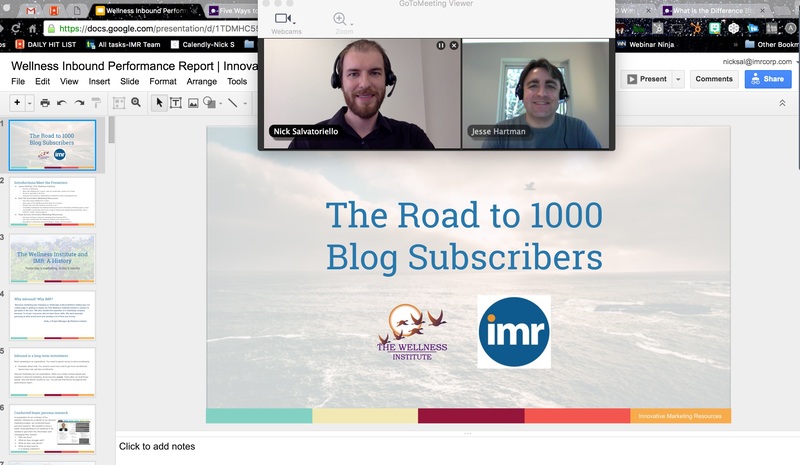 I still try to attend all the episodes of the HubSpot Partner Broadcast that I can! 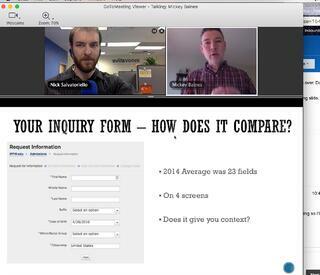 Alex Crumb, my old buddy from the HubSpot Partner Services Team, now leads up producing the monthly webinar - and he's CRUSHING IT! So funny, engaging, and with increased production value. It's awesome to be able to kick back and enjoy the program from the other side. 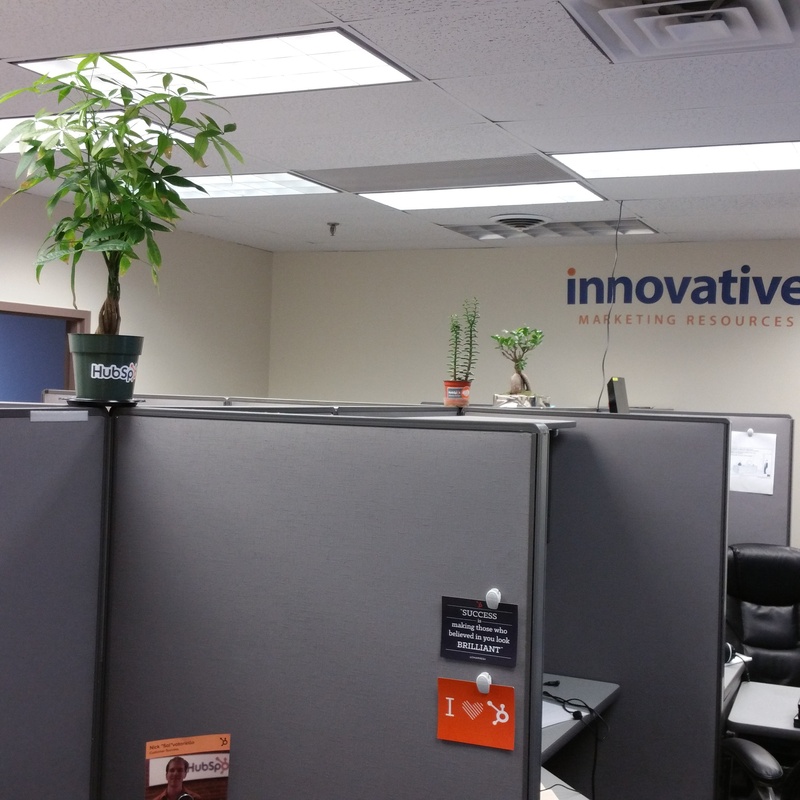 I try to be a good HubSpot Partner and be an active participant each month - like I did here on 4/21. The IMR Inbound Team took a fieldtrip out to the offices of our sister company, a direct mail and shipping outfit calls Innovative Fullfillment Services in Shirley, MA at the end of April. 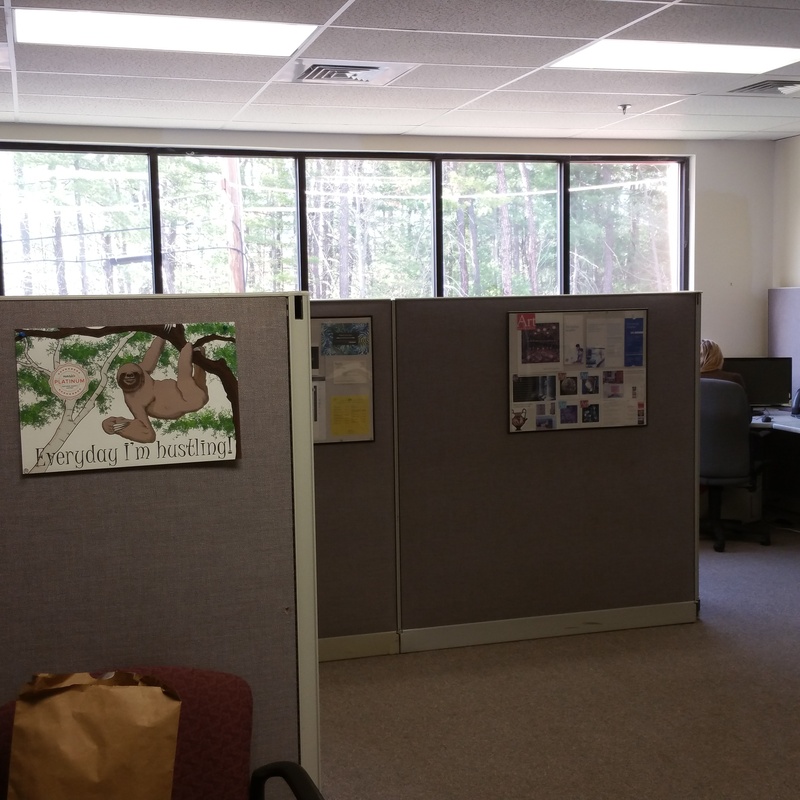 As you can see, the view out the windows of our Shirley offices are a lot more of the pine trees found there vs. the vistas of corporate office parks we have out the windows of IMR's HQ in Waltham. 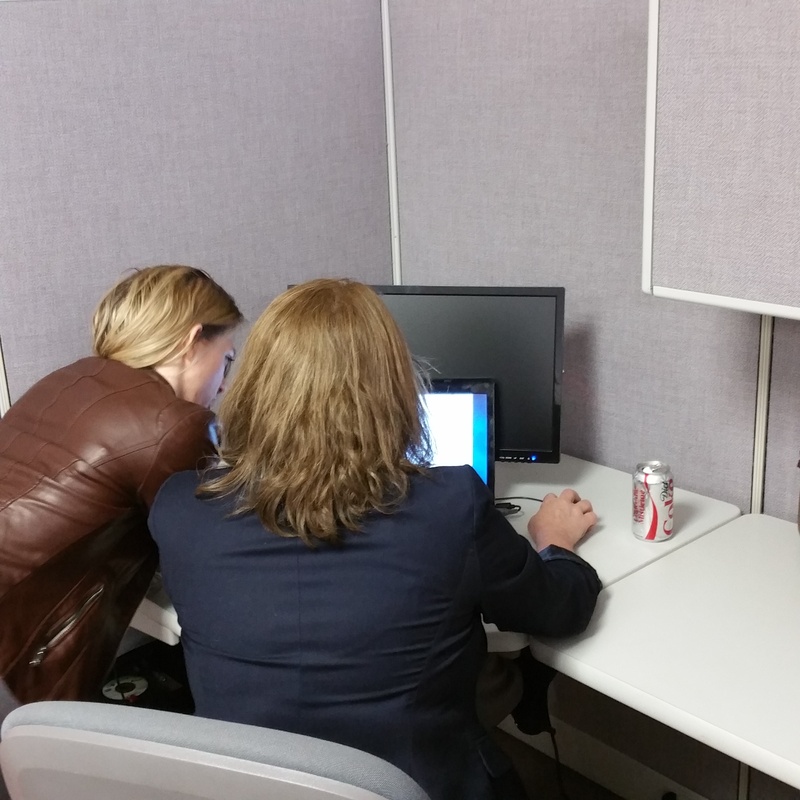 Danielle and Beverly collaborating while working out of the offices of our sister company, Innovative Fullfillment Solutions in Shirley, MA at the end of the month. IFS has a 30,000+ square ft. warehouse and employs another 20 people. 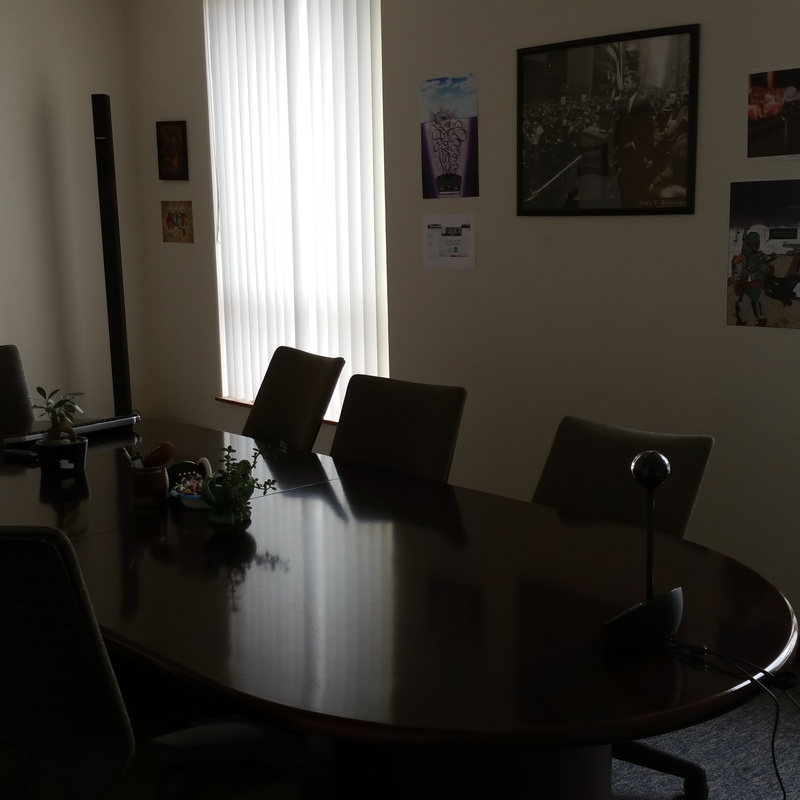 The last IMR related photo I took in April was of "The Thunderdome"
As April came to a close, I took a pic of the IMR conference room which we have re-christened as "The Thunderdome" (because this is often where the big show and tell presentations take place). One thing I want you to appreciate here is that this room was almost completely bare when I came in 6 months ago. Now it's got plants growing on the table, quirky pop art on the walls, a new remote-controlled web conference camera at one end and a pro audio PA system for rocking tunes and announcements in the other corner. All these things - the personality, the style, and the technology - represent areas we have grown into culturally as a team over the last 6 months. What's coming up next? "May-day, may-day! Hitting walls, then surfing the wave over them. [Month 7 recap]"
Thanks, everybody for your patience while I took the time to get this post out. More on the way shortly. Look out for my month 7 recap where I break down all the things that, well, broke down at the agency in early May as we continued to reshuffle and organize the team, all the while growing and taking on more and more accounts. It was pretty touch and go for the agency until the end of the May (on multiple fronts). But, like usual, this scrappy team pulled ourselves up by our bootstraps and ended May STRONG. Looking back, month 7 (May) was by far the most intense but also the most rewarding of my agency leadership experience so far. Be sure to check it out once I publish it (which I hope is ASAP, working through a backlog here, heh heh). If you've been reading all along the way, what's your assessment of how I'm doing for my frist six months leading up a small, but growing inbound agency? Have you been in my shoes here? Anything that you would have done differently up to this point? I'm a big boy, let me know! What would you like to know more about? I never can tell with my subscribers what exactly they are looking for, so tell me - what stood out to you here that I could elaborate on more? I pledge to reply back in the comments with more details on anything you'd like to know - committed to transparency here! Do you have your own agency leadership and/or HubSpot implementation experience to share with my readers? Please do so we can all contribute to the conversation and all get better!